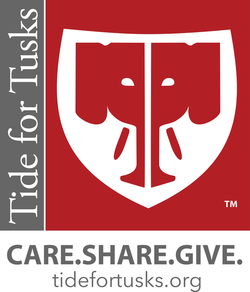 The University of Alabama in partnership with Tide for Tusks recognizes the important role that our University mascot can play in helping to save the elephants. Working with our talented faculty and students, this partnership offers a range of innovative learning experiences that focuses on enhancing students’ abilities to help solve “real world” problems related to their disciplines through their involvement in high quality experiential learning opportunities. Through research and hands on activities in Tanzania and at home, our students will have the opportunity to engage in field assessments that will result in more and higher quality learning opportunities. The University of Alabama offers an abundance of resources that address nearly any topic imaginable. Combining scholarly research with our collective social and intellectual capital, we can help to raise national awareness for the plight of the elephants.